The comet that Rosetta space probe was going to visit originally. Cometary orbits are usually very eccentric elliptical orbits around the Sun. Because of the high eccentricity, a small segment of the orbit is relatively close to the Sun, while the major part of it is farther away. Comet nuclei are small bodies consisting of rock, dust, water ice and frozen gas. As they approach the part of their orbit close to the Sun, the increased heat and radiation make the frozen components of the nucleus to sublimate and evaporate, forming a coma around the nucleus. This process is called outgassing. The coma contains water, gas and dust particles loosened by the outgassing. Some comets even have geysers in form of jets of gas and dust breaking through the solid surface of the nucleus. While solid nucleus of comets are small, less than 30km in diameter, the coma is much larger, usually thousands or millions of km, or even larger than the size of the Sun. Most of the comets have two tails while they are close to the Sun. The tails are formed of small particles of the coma pushed away by solar wind and light-pressure. One of them is straight and always points in the opposite direction of the Sun. This tail contains mostly light gas molecules ionised by high-energy radiation from the Sun. These molecules follow the magnetic fields of the Sun. The other tail consists of heavier dust particles left behind, thus this tail is often curved in shape. The comet in the picture is called 46P/Wirtanen, named after the American astronomer Carl A. Wirtanen who discovered it in 1948. It is a short-period comet, because its orbit is relatively small. The orbit's closest point to the Sun is about 1 AU (astronomical unit, the average distance between the Sun and Earth), and the farthest point is about 5.1 AU (around the orbit of Jupiter). The orbital period is 5.4 years. 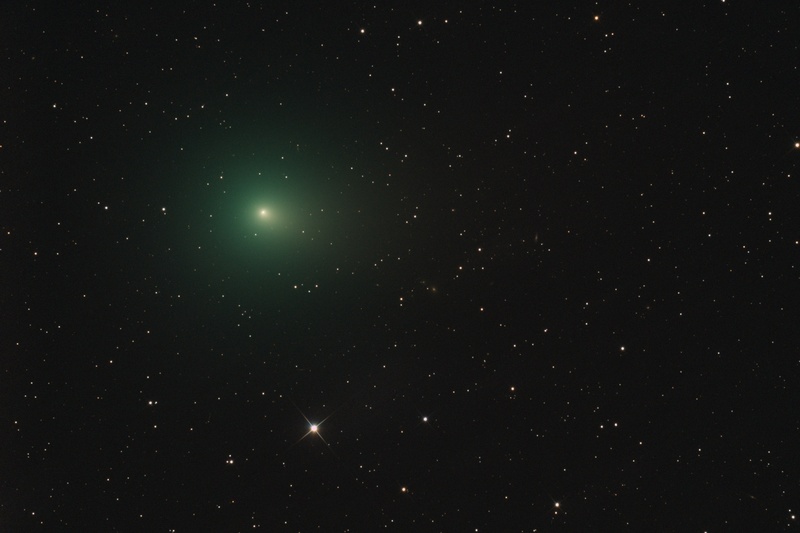 46P/Wirtanen is not an extremely large comet, its nucleus is on the small-end of the scale, being only 1km in size. Despite its small size it was visible with the naked eye for a couple of days during its 2018 close approach when its distance from Earth was only 11 million km. The picture was taken in January 2019, shortly after the close approach. The distance of the comet was already about 23 million km from Earth. The green, diffuse coma can be identified easily in the picture, the star-like bright spot at the center of the coma is unfortunately not the nucleus but the densest part of the coma around the nucleus. The nucleus itself is too small to be pictured from this distance. The two short tails can also be spotted, they are emerging from the center of the coma spanning to the right. In 2003 ESA (European Space Agency) was going to launch space probe Rosetta with the goal of approaching and studying 46P/Wirtanen from close orbit around the comet. Rosetta contained a lander module too that was designed to land on the nucleus of the comet. Although Rosetta's original launch window was missed due to technical reasons, it still made scientific history in 2014 by being the first man-made object successfully entering orbit around another comet after 10 years of voyage throughout the Solar System, by collecting enormous amounts of data from 67P/Churyumov-Gerasimenko while the comet was approaching the inner Solar System, and by successfully launching Philae the lander module that actually landed on a real comet, the first time in human history.